The pilot scheme last term helped us identify four of the neediest children in our community, who without support would not attend school. Daniel, Sanjay, Satoya and Shanakay are in early primary school. It costs £28 per month to keep a child in school. This covers both their school fees and lunches. 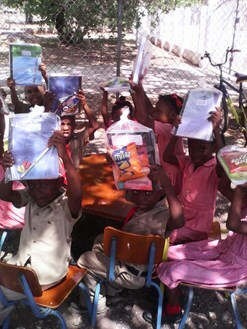 Last term we helped 10 children: making small contributions to help offset the costs of their education. This included; school fees, uniform, shoes and stationery. The impact of this contribution was that these 10 children attended school, many for the first time since as early as February 2015.